Crochet Shells Mobius and more! I think I found something new to obsess over - mobius shawls. Well, shawls in general. I swore I'd never be that person, but I'm starting to fall in love with how quickly they can work up (depending on the pattern's intricacy), and how beautiful they can look when used with the right yarn. 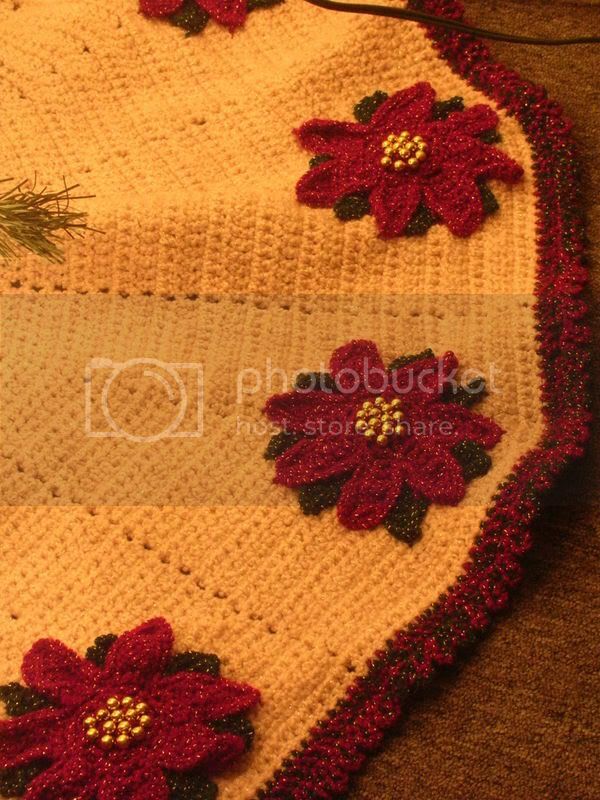 A couple years ago, I had found a tree skirt pattern that I really liked. That year, I had broken up with my long-term live-in boyfriend, and though it was a happy time due to the fact I didn't need to deal with that jerk anymore (hehe), I was then living alone in a town most of my friends had left. It was actually pretty depressing. I turned to knitting and crocheting once again to keep me company in the off hours (okay, and my cat, but I feel like we're crossing the line into crazy cat lady territory here). Anyway, I spent hours and hours and hours, and most of my short Thanksgiving break, working on this stupid tree skirt. I needed tons of Red Heart Holiday yarn to complete it and, at the time, had only been able to find it on ebay. Go figure, considering now I see it everywhere! So for the past three years, I've had piles of this leftover, sparkly yarn just waiting to be used. Since the yarn's purchased, I've left that armpit of a town I had been living in, moved closer to my friends, got a new job, met the man of my dreams, got married, and somehow managed to acuire another cat. Basically, this yarn has been through a lot with me. Enter the Crochet Shells Mobius. I saw it in one of the overly-numerous emails I get from yarn companies throughout the day. I remember thinking it was super pretty, and then getting excited to see it was made out of Red Heart Holiday. Hallelujah! An excuse to bust my stash. So over the course of about three days on and off, I was able to not only use up almost all of my red color (oh, and there are still white and green left to go, too! ), but I made my first mobius wrap, as well. I found some other mobius patterns I've been sitting on for years that I think I'll use for the other colors, and basically build myself a really cute holiday collection. It's super warm, and not as itchy as you'd think with the gold weaved through. Hurray. An FO at last. I actually have a bunch of other completed projects, but I can't show them yet because they are for swaps I'm participating in ;) I can't wait to unveil what they are! So yeah, I've been incredibly busy with making everything for those swaps, as well as starting on Christmas gifts. It's that time of year! And we still need to get started on Thank You's for our wonderful wedding just over a month ago. I feel like such a slacker on those! I promise we will get to them before people forget we even had a wedding! Oh, and I wrote a guest blog over here on how to unravel sweaters to recycle yarn. What a great way to get a ton of yarn at a great price for all your holiday projects!